I haven’t said much about the indigo experiment lately, because there hasn’t really been much to say. I put in the yeast, and I waited. Not much happened. 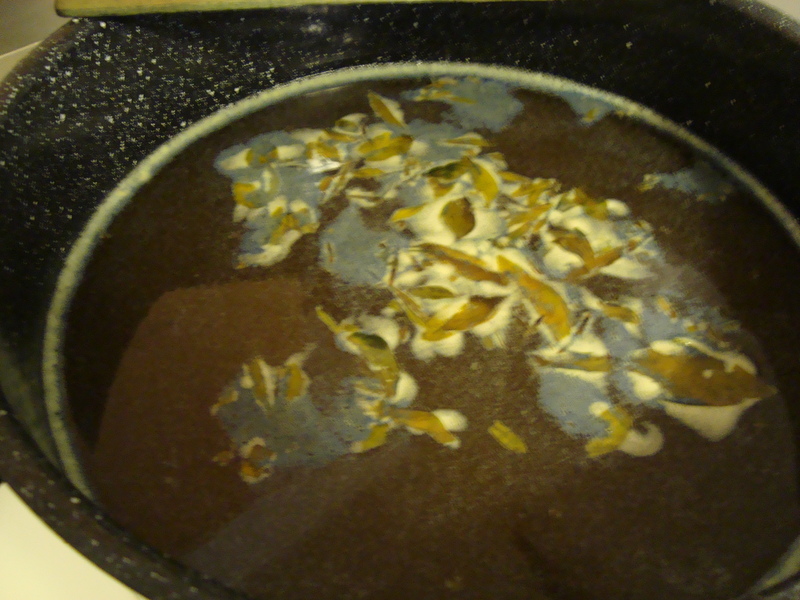 The liquid went from a greenish brown to a reddish brown, but there was no other difference. No happy bubbles to indicate that the yeast was doing its job and devouring the oxygen in the vat. A piece of test yarn came back yellow, so the vat was definitely not ready to dye. 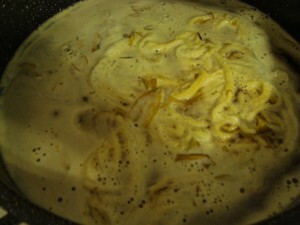 After three weeks of waiting, I decided that fermentation was clearly not going to work, and so I resorted to chemicals. I found a jar of Thioxx (a dye remover) in my dye supplies. I’d bought it a few years ago thinking that it might come in handy, and hadn’t used it since. This seemed like a good time for it to come in handy, so I added a little at a time to the indigo vat. Nothing happened until I’d added about 3/4 of the jar, when suddenly the whole surface went bubbly and tiny little blue flecks appeared in the foam. I took this to be a good sign. I decided to stop here, since they didn’t seem to be getting any darker and it was getting close to dinner time (multiple dips at 20-30 mins each makes for a long day of dyeing). 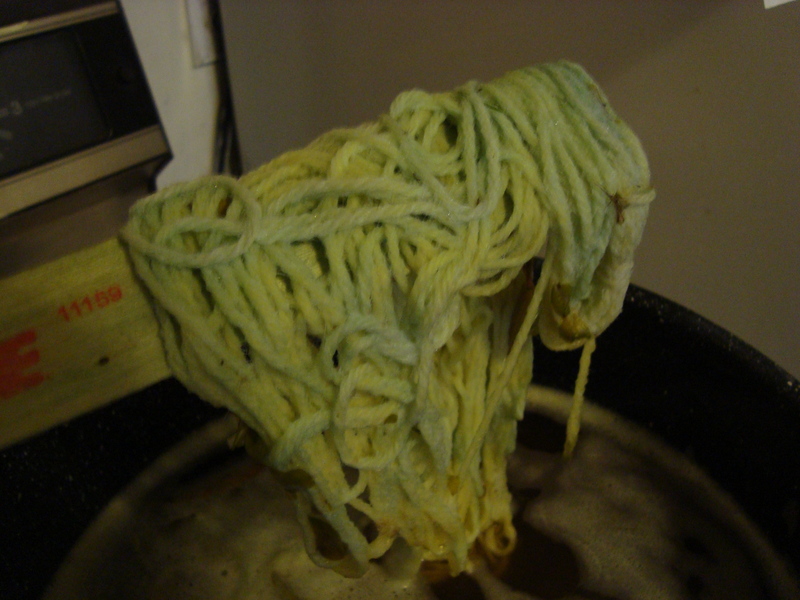 I was thinking more about cleaning up and cooking dinner than I was about the yarn, so I filled the sink with water and threw the skeins in to rinse them of their chemicals. Had I thought about this for even a few minutes, I would have realized that this classifies as a Bad Idea. 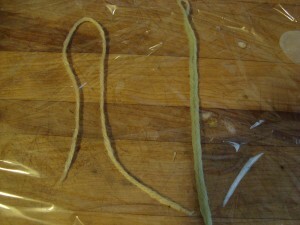 I’m used to working with acid dyes, that actually bind to the fiber once heat treated. You always finish them off with a rinse to get out the extra dye. But indigo doesn’t work like that. 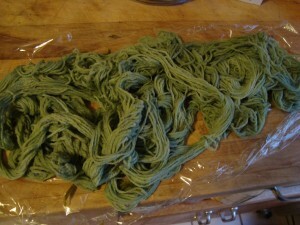 Indigo dyes fiber when the dye dries in place. Throwing freshly dyed skeins into a sink full of water before they’ve had a chance to finish binding effectively removes all of the color that you’ve just painstakingly put in place. This became apparent as soon as I swished the yarn, but it was too late to do much about it. I finished the rinse so that the chemicals wouldn’t drip all over the bathtub, and we’ll see what comes of it. At the moment, they’re looking like a pale seafoam green, which is fine with me. I’m rather surprised that all of this worked, given how little I knew about what I was doing. I learned that Thioxx gives off sulfur dioxide and smells up the kitchen, and that it irritates my sinuses. Fortunately, it was warm enough to open the windows for ventilation today, so it wasn’t too bad. I’m not sure that most people would even have been able to detect the smell, but I tend to be hypersensitive, and it appears that I need abundant fresh air when indigo dyeing. As with the last time I did natural dyeing, I find myself unconvinced that it’s any safer than the standard “chemical” dyes. Honestly, I was a lot less comfortable working with strong bases and gas-producing reducing agents in my kitchen than I am with vinegar and a little dye dissolved in water. 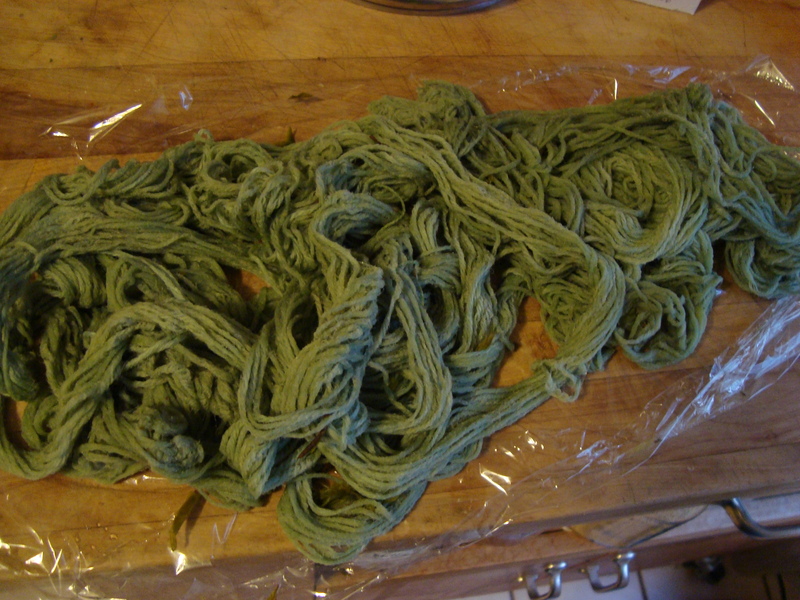 It was really fun to see the process, and it was cool to see the color change when the indigo hits the air, but I’m not sure that I’d call this any safer than my standard dyeing in saran wrap, and I think I’d prefer to wait until I have an outside area for dyeing before getting too serious about the natural dyes. There were also a couple of things that I’d probably pay more attention to the next time around. Even my darkest skein was pretty pale, so I think there wasn’t a lot of dye in the pot to begin with. This could have been from the leaves themselves (the plants were well into blooming when we picked them, and they’re best before they flower), or it could be from too little base during the extraction. The base (washing soda) needs to react with the indigo in the leaves to prepare it for dyeing. If I didn’t add enough, I might not have extracted all of the dye from them. It’s also possible that the storage period did some damage, but I think that’s unlikely since you’re supposed to be able to store indigo vats for years at a time. All in all, I think that this was a pretty successful experiment. I didn’t end up with mounds of deep blue fiber, but I wasn’t really expecting that, and I’m honestly just glad that it worked at all. I’ve learned a little bit about the visual indicators that I’m looking for when making the dyebath, and I think I know what I’d like to tweak next time. 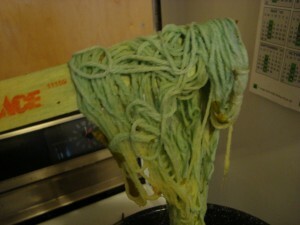 And I have definitely learned that you wait until after the skeins have dried to rinse out the chemicals! I have two more bunches of leaves (one frozen, one dried) to test out at some point. I’m not sure that I’ll get to it right away, but it will be interesting to see what happens! Sorry it didn’t work out. We just had someone at our 4-H fiber arts do an Indigo dye demonstration. 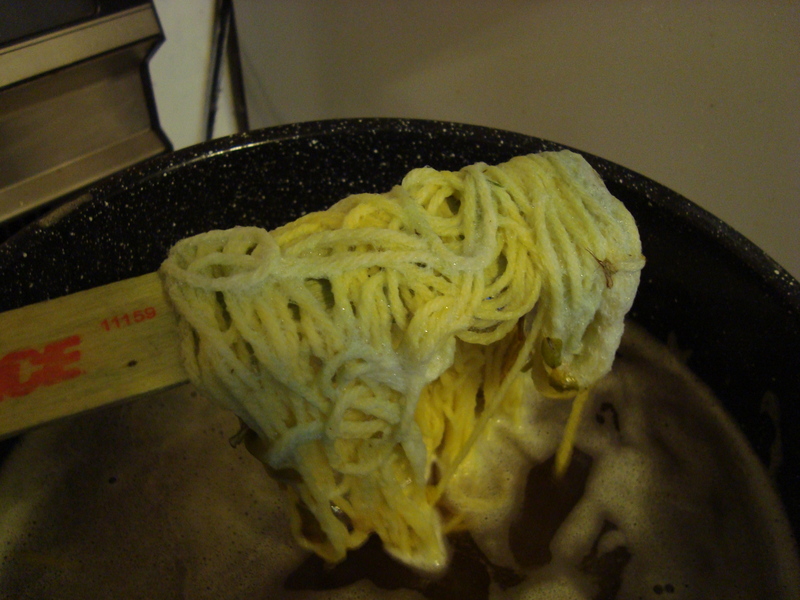 She said that if the dye gets above a certain temp (I think 130 or 140 degrees F, the batch is ruined. I don’t know if this was the issue or not, but I thought I’d offer it up. Lovely to get green from indigo by over-dyeing yellow. 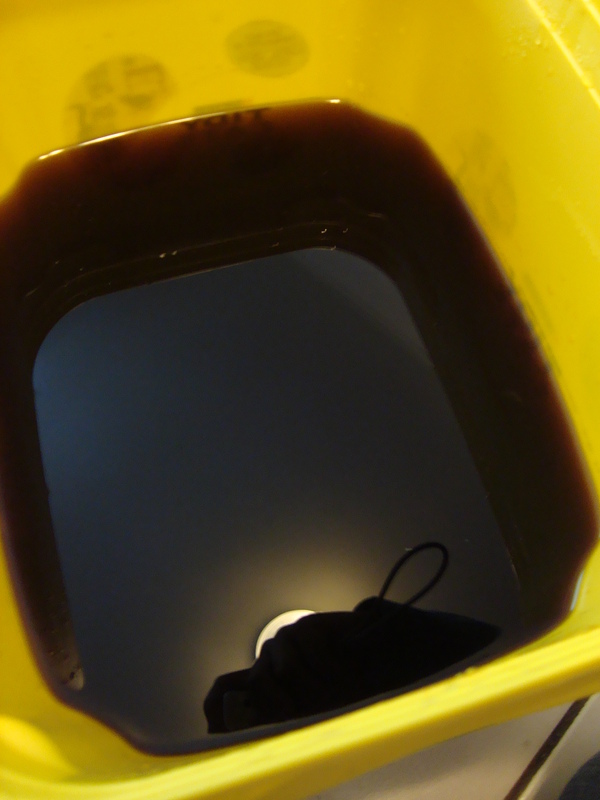 I’m sure there are ways to measure the reducing potential of the dye pot, but that kind of takes the joy out of it. I wondered about how you might feed the yeast with some sugar or something to get them going and sucking the oxygen out of the bath. 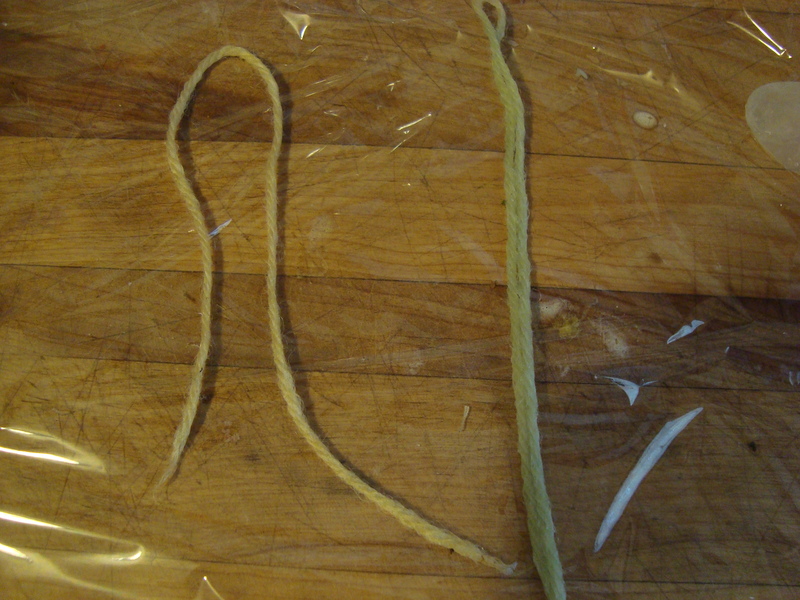 I wonder if that would make for sticky yarn? It’s interesting to read the results of your experiments. It sounds like there are more variables than I would wish to mess with, though! I’ll do my indigo dying vicariously, I think. Definitely an interesting experiment, and a lot to think about chemically. I’m glad that you’re happy with the results, and with the learning curve as it goes along. Looking forward to seeing the next steps! DesigKnit is powered by	WordPress 4.8.9 . Page generated in 0.810 seconds using 39 queries.